MICROWAVE semi-sweet morsels and vegetable shortening in small, uncovered, microwave-safe bowl on HIGH (100%) power for 20 seconds; STIR. The morsels may retain some of their original shape. If necessary, microwave at additional 10- to 15-second intervals, stirring just until morsels are melted. DIP the end of each candy stick in melted chocolate, tilting bowl to easily dip. Use side of bowl to remove excess. Place on prepared baking sheet. Refrigerate for 15 minutes or until set. MICROWAVE white morsels in small, heavy-duty plastic bag on MEDIUM-HIGH (70%) power for 20 seconds; knead. Microwave at additional 10- to 15-second intervals, kneading until smooth. Cut tiny corner from each bag. 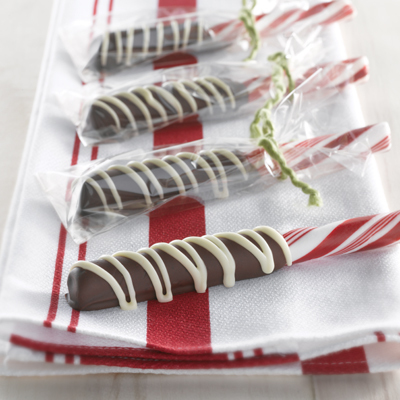 Squeeze to drizzle over ends of already dipped candy sticks. Let stand until set. Insert candy sticks into bags and secure with ties. Store at room temperature.